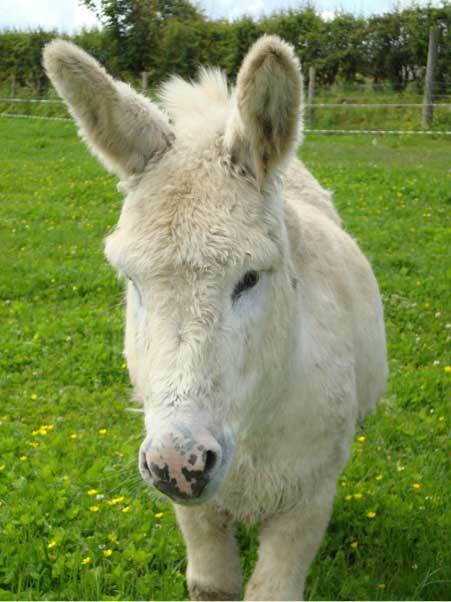 Binky is a beautiful, white, fluffy donkey who was relinquished to the sanctuary because of his lovely nature. His elderly owner could no longer look after him & decided that he would be wonderfully suited to meeting young children and adults with special needs. Binky has indeed been a wonderful addition to the resident donkeys and enjoys life at the sanctuary very much. He holds the distinction of having been the only donkey to ever walk across the ‘Peace Bridge’ in nearby Derry as part of a Christmas nativity scene. The local police even stopped the traffic to allow him to cross the road. A very special donkey indeed! For €25 a year you will be contributing to the welfare of this donkey and the continued work of Donegal Donkey Sanctuary. We really appreciate your generosity.